Performed at Old Cabell Hall, on Grounds at U.Va. Music Director Benjamin Rous opens the orchestra’s 44th season with Sibelius’ majestic Second Symphony. Beloved for its optimistic tone and triumphant finale, it remains the composer’s most popular symphony. It’s paired with Thea Musgrave’s mystical Song of the Enchanter, written to commemorate Sibelius’ 125th birthday, and a rarely-performed gem: York Bowen’s grandly romantic Viola Concerto, featuring Principal Violist Ayn Balija. 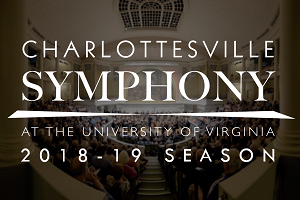 Join UVA Associate Professor of Music Richard Will for a Pre-Concert Lecture on Saturday, September 29 at 7:15pm in Maury Hall, Room 209. For the Saturday night concert, free parking is available in the Central Grounds Parking Garage.